~ The 50th anniversary of the band The Beatles, arrival to America has inspired footwear brand Vans to create a dedication collection. This collection consist of artwork from the Album cover and film “Yellow Submarine“. 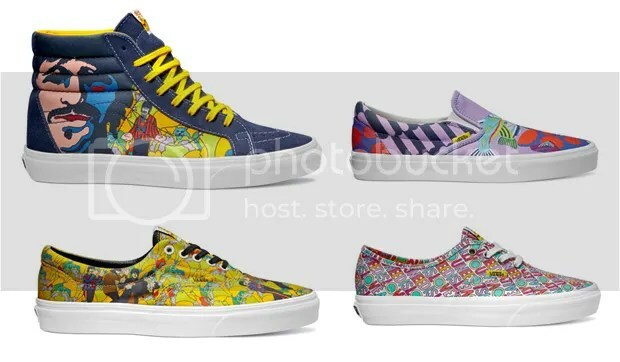 They put a classic spin on the Sk8-Hi by featuring portraits of all the band members along-side the ankle, the traditional Slip-on’s has a psychedelic view of marine life swimming in pink, the Era pictures all four members in the Yellow Garden, and the Authentic is in purple, yellow and green with an all over pattern reading “All You Need Is Love”. This Collection is Now Available online. Next Next post: Lifestyle | DrakeWeather is Real!